There's a long tradition in Hollywood of particular groups of actors working together in multiple films. In recent years, we've seen the George Clooney and his gang in the Ocean's movies, Will Ferrell and Adam McKay gathering a group of crazy guys for movies like Anchorman and Talladega Nights, and Seth Rogen and James Franco teaming up for often disappointing flicks that center on pot. I know that some see this as stunt-casting and view it as something akin to nepotism, but I enjoy it. I've always said that, as we know that many actors are friends, I would like to see more movies where the stars clearly called up their friends to come and spend a day on the set. Scott Foley clearly heard my thoughts, as he's filled his family and co-workers in the odd romp Let's Kill Ward's Wife. Ward (Donald Faison) and his wife, Stacy (Dagmara Dominczyk), have just had their first child and they should be very happy. But, Stacy is a demanding woman who is never happy. She berates Ward and insults everyone around her. Ward's best friends, Tom (Scott Foley), David (Patrick Wilson), and Ronnie (James Carpinello), feel sorry for Ward, and they never see him on the golf course anymore. Of course, their lives aren't perfect either. David, an actor, is separated from his wife. Tom, a journalist, and his wife, Gina (Amy Ackers), are rarely intimate anymore. Bored with his life, Tom begins to research ways in which this group could kill Stacy and get away with it. Is he serious about this? And if it really did happen, how would everyone deal with it? Scott Foley has been acting for 20 years and he's bound around Hollywood with small roles in films (remember him in Scream 3?) and prominent roles on television shows like Felicity, Scrubs, and Scandal. (He's also known for being Jennifer Garner's first husband.) While Foley has worked consistently, he's always struck me as a somewhat benign person. (Again, see Scream 3.) So, not only was it surprising to see that he'd written and directed a movie, but that the movie was so dark. Let's Kill Ward's Wife is a very dark comedy, which doesn't shy away from violence and decidedly tasteless jokes. This is the kind of movie which came of age in the 90s where it wasn't unusual to see a shocking amount of blood in an otherwise quirky movie. This is obviously a movie which isn't mean to be taken seriously, but could definitely offend those who aren't in the mood for something tongue in cheek. In fact, Foley may have taken his dark streak too far. In order for any of this to feel justified, Stacy must be presented as an awful person. However, her nastiness is so over-the-top that the movie feels ludicrous at times. We've seen hen-pecked husbands before, but the relationship with Ward and Stacy is one of those which is so awful that it feels unbelievable. Still, while this isn't necessarily easy to watch, it's somewhat light-hearted and can be taken with a grain of salt. However, once the movie goes dark, it goes real dark and goes from being a study of friends and spouses to a crime thriller. Foley also appears to be working too hard to prove that he can write a movie. If the title is to be believed, the focus should be on Ward and Stacy. However, David is actually the main character here. In fact, Foley seems to go out of his way to focus on everyone but Ward and Stacy. To be blunt, the movie has too many subplots and characters. There is scene-after-scene of David, Tom, and Ronnie talking, or Tom and Gina at home, which is ostensibly supposed to be expanding the characters, but in reality, it feels as if the movie is actually skirting the issue and giving us filler instead. In the end, the most interesting thing about Let's Kill Ward's Wife is tracing the real-life relationships between the actors involved. Crank up IMDB while watching the movie and you'll find yourself playing "Six Degrees of Scott Foley". I won't ruin it for you, but there are a lot of spouses here and Foley clearly wasn't afraid to call people that he'd worked with on TV shows. If only the movie were this fascinating. Again, it's neat to see an actor fill his movie with other familiar actors, I just wish that Foley had turned to someone else for the script. 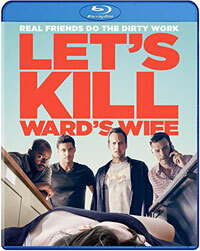 Let's Kill Wards Wife will (hopefully) make you appreciate your marriage on Blu-ray Disc courtesy of Well Go USA. The film has been letterboxed at 1.78:1 and the Disc contains an AVC 1080p HD transfer which runs at an average of 25 Mbps. The image is sharp and clear, showing on overt grain and no defects from the source materials. The colors look good and the picture is never overly dark or bright. Foley has wisely chosen to shoot the film in a very natural style and some scenes are incredibly crisp. The level of detail is noticeable and the depth is good. The Disc carries a DTS-HD Master Audio 5.1 track which runs at 48 kHz and an average of 2.1 Mbps. The track provides clear dialogue and sound effects. The movies doesn't contain a great deal of dynamic effects, but the musical cues due fill rear speakers. We are treated to a few stereo effects which highlight sounds coming from off-screen. The Let's Kill Ward's Wife Blu-ray Disc is a bit lacking in bonus features, as the only extras are a 3-minute reel of OUTTAKES and a TRAILER for the film.